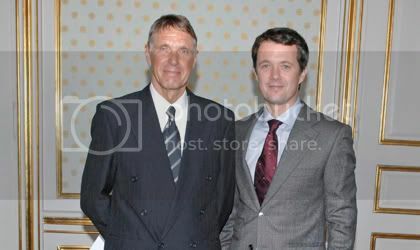 Crown Prince Frederik awarded this year's Anders Lassen Foundation grant in Christian VIII's Palace, Amalienborg, last Wednesday (September 24). Frederik is the patron of the Anders Lassen Foundation. The foundation rewards exceptional military zeal and assists wounded Danish military personnel. It also grants assistance to people or their beneficiaries who have done exceptional humanitarian deeds should they experience economic difficulty. In addition the foundation grants funds for members or former members of the JAGERKORPSET or the Naval Frogman’s Corps or to their family. The grant went to the children of a member of the Danish Royal Lifeguards, Anders Storrud, who was killed in the Helmand-province in Afghanistan last year. The children receive the grant in memory of their father. 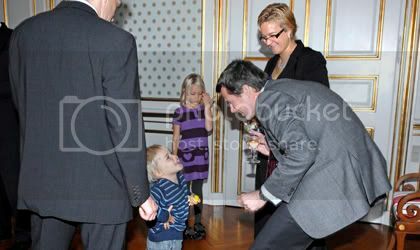 Little Trine Storrud, who gave Frederik a colourful drawing, was at Amalienborg with her little brother Ståle and their mother Susie Storrud. Susie Storrud said the money will be invested for the future education of the children, but even more important was the ackowledgement of her husband's sacrifice. At Amalienborg the two children of major Anders Storrud, who was killed in combat in Afghanistan last year, each received 25,000 DKK from the Anders Lassen Foundation. The children were two and seven when their father was killed. They were accompanied by their mother Susie Storrud. The purpose of the foundation is to acknowledge the service men and women who are killed or wounded in the line of duty. Major Anders Storrud was a field officer in the genuine sense of the word. Very respected and well liked by his men. The battalion he was stationed with in Afghanistan was involved in the heaviest fighting Danish soldiers have been involved in since 1864. It has been worse than some of the incidents in Bosnia and Iraq, not to mention Musa Quala. The battallion suffered significant casulties while at the same time killing an estimated 200-250 Taliban forces. The current battallion serving in the Helmand province has hardly seen any action at all. The Taliban has gone! They have suffered a few casulties, mainly from Improvised Explosive Devices (IED's), but apart from the tank squadron which has seen constant action since their arrival last year, mainly in support of Afghan forces. Anders Lassen was a Dane who served with the SBS (= Special Boat Squadron*) in the Mediterranean during WWII. He basically shaped and led the force, which was a genuine menace to the Germans. He was killed in Northern Italy towards the end of the war at the age of 24, and won Britain's highest military honour, the Victoria Cross. * The SBS was the inspiration for the Frogman Corp, using very similar tactics and ways to approach things, so Frederik is very familiar with the history of Anders Lassen. Big thanks to Muhler! And also jema! Anders Lassen fought with my father at Comacchio during WWII. Anders Lassen died at Comacchio and earned a VC. My father was in the SBS and SAS during WWII knew and fought the Germans with Anders Lassen. My father now lives at Algester, Queensland Australia. Thanks for this information. Would you mind emailing me at drws.blog@gmail.com? I would love to follow up on your father's experience.